Nonalcoholic Beverages, Volume Six in The Science of Beverages series, offers a wide-range of knowledge and expertise from research professionals around the world. The book focuses on the research and development of innovative products and new growing trends based on consumer demand for natural drinks that have health benefits. 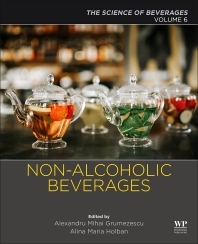 The book discusses the properties and benefits of developing nonalcoholic beverages, their production particularities, associated properties, physiochemical characteristics, and methods to help researchers and students learn about utilized nonalcoholic beverages.